In addition to the online and PDF reports, you can download a range of additional reports in Excel format. These can be found in the 'Excel reports' section of the Reports Centre. These include financial and KPI results, and detailed variance (budget vs actual) reports. The 'Forward Projection' report also includes a projection of your financials, using your budgeted figures for the current financial year. For what period ranges can data be included, in the Excel reports? Excel reports can be generated for any month, quarter or year. However, reports such as the 'Forward Projection' report require a budget to be imported for this company. If a report is greyed out hover over the tool-tip (?) to see what it requires before the report can be generated. 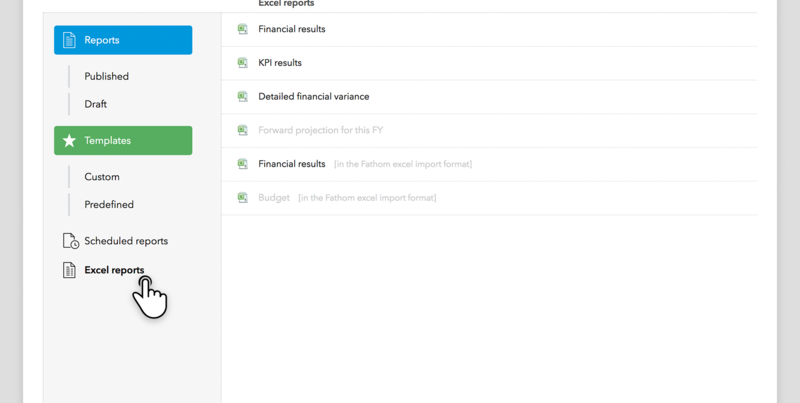 What is the purpose of downloading an Excel report "in the Fathom excel import format"? When the company is sourced from Excel, this report enables you use to easily download an import template that includes your existing financial data. You can then use this template to update your existing data, or add new financial data, to update your company in Fathom. Downloading this report will also allow you to easily create a scenario, using your existing data as a template. For example, you can download this report and edit the data to model a specific scenario. This can then be imported into Fathom as a new ‘company’.